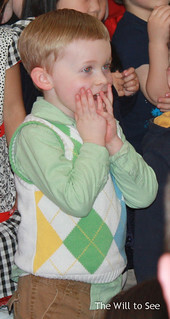 Yesterday was Jack’s Songfest, a concert put on by his preschool class. 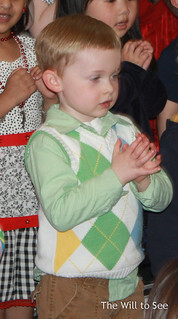 Since he attends a Montessori preschool we don’t have religious concerts or celebrations. This is our only one concert or show each year. Jack started preschool early, at 2 1/2, because he was that advanced. 🙂 (Seriously, it was because he was ready and I was ready for him to do something by himself or at least that is the mantra I had to say as I drove to my friend’s house in tears the first morning.) 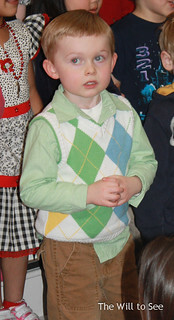 His January birthday made starting preschool awkward. He was ready for something more, but not all the schools would take him. We were able to find Lakeside Montessori and we have been so happy with them and he has just loved. His second year, he again stood in the front row (still not tall for his age) and this time he sang over half the words. He got the hand motions right, but was still distracted by the jesters of those around him. He was more animated and followed the instructions better. I will miss the Songfests as he moves up to Kindergarten next year, but hopefully William will get to do them when it is time for him.